Thai Airways is solely owned by the Thai Government. They made their first flight in May 1960. Flights originally offered to just nine Asian destinations, departing out of Bangkok. The first international service were offered starting in 1971, going to Australia, then in 1972 flights to Europe were started, leading full scale into America in 1980. Thai air is a targeted growth company. Although they have suffered harsh times in the face of economic depressions over the years, and more recently the staggering fuel costs from 2005-2008, when costs double and tripled at times. They made it through though, and now find their fleet at a solid 91 active planes, with 14 new modern planes on order. Plane manufacturers can plan to be busy, with so many companies doing away with their old planes, and bringing in the new. Thai Airways Business Class is termed “The Royal Silk Class” by the company. Their frequent flyer is known as the “Royal Orchid Plus”. The company website can take interested people further into details of the plan. Pre-flight Customers have exclusive check-in counters and fast-track immigration clearance. Thai Airways Business Class “Royal Silk” passengers are invited to use one of their many Royal Orchid Lounge facilities including: Internet access, showers, light refreshments and child entertainment areas. On board THAI flights Royal Silk class passenger enjoy totally segregated cabins. On long-haul flights, newly introduced shell seats offer 60 inches of length of out-stretched space, reclining 170 degrees for sleeping. 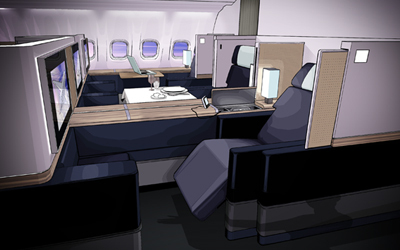 Each electrically adjustable seat has a telephone – with worldwide communication, and laptop power outlet. The latest on-demand entertainment system includes an over-sized monitor, touch screen controls, that offer hundreds of channels, music, interactive games and worldwide news channels, that include a sky map flight progress chart, and exterior cameras offering views of the ground on take-off and landing.. Passengers in the Business Class will also receive bountiful amenity kits. Thai Airways Business Class (Royal Silk) travelers are most often Thai Airways most adept choosers of gourmet food, and fine wine. The Royal Silk Class promises exquisite tastes will be fulfilled. International Thai master chefs have really pulled all of their resources together, in the creation of exclusive Royal Silk Class menus (Changed often to create variety). Taking pride in pleasing appearances, the meals are served on porcelain dish wear, lovely table linens and the finest crystal – for your vintage wine, champagne, and liquors. To avoid unforeseen changes in your travel plans, and the possible consequence to your companies business interactions, planning to your trip is important. Agents specialising in travel can help get you a better deal, and help you pick the right plan to meet your business class travel needs. You can book through a Thai Airways website agent, but keep in mind the travel agents goal is to make travel easy for you – they get paid to make you satisfied. Security and travel insurance are all taken care of for the country you visit.